Since our bike project began with $360 in 2009, we have given away 700 bicycles. They have been the key to our village students continuing on to high school and to our technical school graduates having reliable transportation for work. In 2009, the Cambodian School Project’s first students at Poum Steung graduated from sixth grade. For many of the poorest students in the villages, particularly those living far from the high school, this meant their schooling would end. Those farthest from the school would have a 10 Km round trip to get to high school. And two long walks in the hot sun would take too much time away from family responsibilities. They did not go to high school. We began a pilot project, working with village elders and families, to give eight sturdy bicycles to the poorest students living farthest from town so they could continue on to high school. 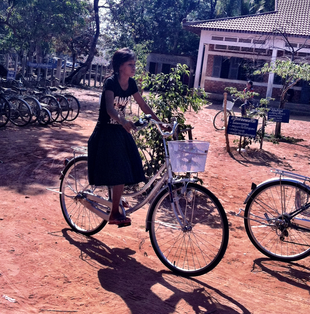 The bicycles made an immediate difference in students continuing their education. In a village culture, when you give something as important as a bicycle to a child, you are giving it to the whole family. 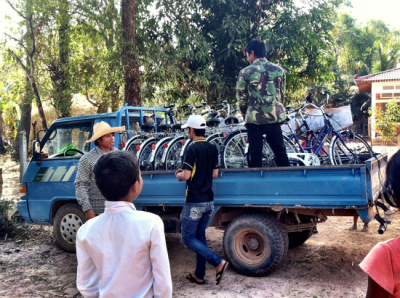 Sarith Ou, our founder who administers the bike program in Cambodia, said that when you give a child a bike, it is like you gave the family a car because of the possibilities the bike offers. Prouen’s grandmother carried firewood to sell at the market on Prouen’s bike. Not only did Prouen get to go to high school, but because of the bike her struggling family had more income. The 1996 United Nations State of the World's Children Report states that if a girl attends high school (not graduates, simply attends), her children are likely to have better nutrition and to stay in school longer. This means the simple gift of a bicycle now that helps a child continue on to high school can improve life for the next generation. A 2004 United Nations State of the World’s Children report explains that further education for girls leads to a reduction of child mortality, healthier families, and fewer maternal deaths. Both their sons and daughters are likely to attend school longer than they did. These studies suggest that the $50 we spend on a bicycle is one of the best investments we can make for our students and any children they may have. Around 90% of our sixth grade graduates at Poum Steung School now go on to high school. This is roughly twice the average high school attendance rate in Cambodia. The bicycles have been key in changing the village expectations about attending high school. Our school for the indigenous Kouy is on a dirt road through scrub forest five miles from the high school. We started giving bikes to Kouy girls and boys because none of our students were going on to high school. Since then, our bikes have meant that over 100 of the poorest Kouy students have now continued on to high school, significantly raising the literacy and education rates in their villages. Most of our JHP Skola graduates work in the city of Siem Reap, and the housing they can afford is a good distance from their jobs. The bikes we have given them are crucial to their getting to work on time and doing well in their jobs. From our careful beginning with eight bikes in 2009, we now are giving away around 100 bikes a year. We buy our bikes locally to ensure their quality and to support local business. For $50 we buy a solid bike with a large basket, a rear carrier, new brakes and new tires, a bike that can negotiate ungraded roads. And with that bike, lives are changed. If you would like to contribute to our bike project, please go to our Donate page.